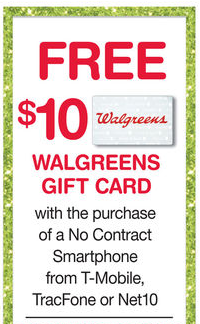 If you are participating in the Walgreens Balance Rewards program, check your email or their website or your app! A new promotion via coupon (you must clip the coupon first before you can earn the bonus) offers you 7000 Bonus Balance Rewards points (that’s $7 equivalent) when you make qualifying purchases of $20+ at their website or their B&M stores! The promotion runs November 11-17 in 2017, the usual Sunday AM to Saturday PM week that coincides with their Weekly Ad. The promotion may be in the Weekly Ad, I don’t know? If you are participating in the Walgreens “Balance Rewards” program, a chance is coming! Starting August 25 in 2017, your rewards will be expiring after 12 months. This is on a rolling basis depending on when you earned the rewards. This will make it harder to bank reward points so you can redeem them for the bigger and better prizes. This also means that if you don’t pay attention, you will likely lose most of your points. A little known fact is that you can redeem as little as 1000 points, which may sound like a lot but it’s actually just $1. 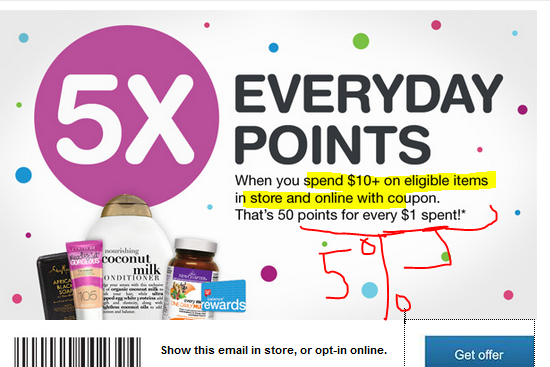 Walgreens is one of only a few companies that do the sneaky thing of equating 10 points to a penny, making it look like you have a LOT of rewards, when you don’t actually. Most other companies these days are honest enough to do 1 point = 1 penny, which makes it easier for the consumer. 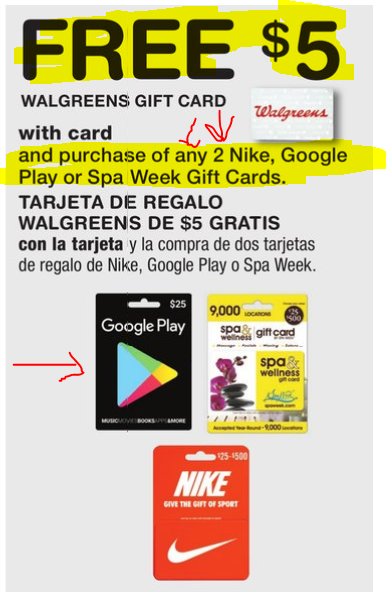 Good until Saturday night 7/22/17, at your local Walgreens brick and mortar stores, you can get a free $5 Walgreens gift card, if you purchase any two Google Play, or NIKE or Spa Week gift cards. This is promising because there are $10 Google Play gift cards, so you can pay $20 (two $10 gift cards) and get a $5 Walgreens gift card. Assuming you have no problem spending the Walgreens gift card, that’s a $5 return on a $20 investment, a 25% return or virtual discount, however you want to account for it! You need to be a Walgreens rewards member, which is free to join. I don’t know how many of these you can do during this week. I haven’t done this yet, but I’m planning to do this (unless I forget). 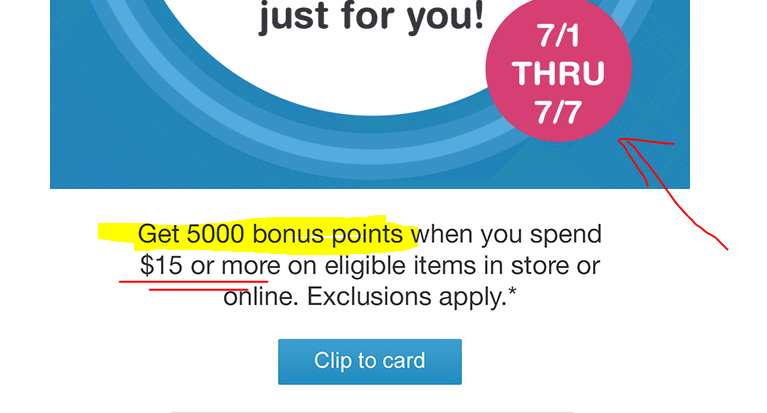 If you are participating in the Walgreens rewards program, and if you have been offered this promotion (check emails or coupon page), and if you “clip to card”, between July 1-7 in 2017, you will earn 5000 bonus points if you make a single purchase of $15+ at Walgreens in-store or online. You must first “clip to card” before you make the purchase. 5000 bonus points are the equivalent of $5 in spending power (or slightly more if you bank your points for a higher redemption reward). Walgreens is doing the goofy thing where 10 points are the equivalent of a penny. The simpler (and more honest) thing for rewards points to use 1 point = 1 penny, to make it easier for the average consumer to figure things out. It’s not like the Walgreens rewards program is complicated enough that the extra level of accuracy is needed! The one below is a screenshot. You must needs click on the thing in your email or the Walgreens coupons page. 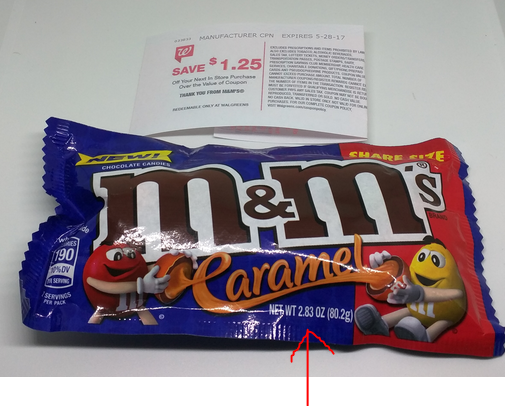 Good until May 20 in 2017, at Walgreens brick and mortar stores, you can get a “share size” 2.83oz bag of the brand new Caramel M&Ms for FREE in the way of Register Rewards. You pay $1.25 at the store, and the cash register will print a $1.25 register reward, which you can use in a future purchase at Walgreens. Since this is a Register Reward promotion, I do not know if you can keep going back and getting more. I haven’t done a promotion like this in recent months, so I don’t know if they change how ti works. From what I recall, you cannot use the Register Reward for this product to buy another similar product, and still get a new Register Reward. So if you are going to try to stock up, you may want to use “new money” to pay for these. 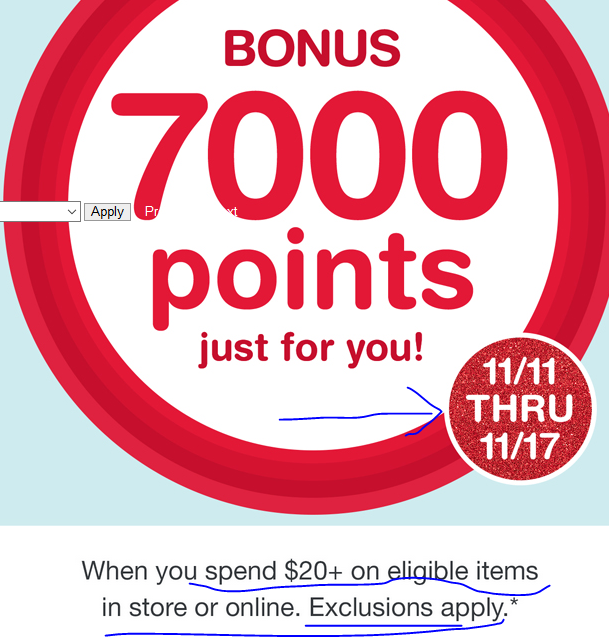 If you are a frequent Walgreens shoppers (in-store or online), running between October 16-22 in 2016 is a “5X Points” promotion on purchases of eligible items that total $10 or more (before taxes/fees). You can add this offer to your account from the weekly Walgreens emails or from their website or use the coupon in their Sunday paper ad. Walgreens advertises this as “50 points per $1” but this is where I grab them by the ear for intentionally misleading customers with the design of their rewards program. By making it sound like they give more points than they actually do. You see, most rewards programs have 1 point = 1 cent spent. Walgreens is sneaky, 1 point = 0.1 cent. 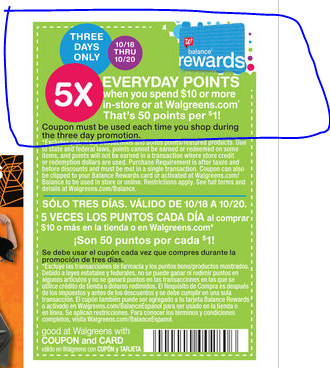 So when they say 50 points per dollar, you still just get $0.05 equivalent in points, which is 5%. For the week of April 17-23 in 2016, at Walgreens brick and mortar stores, you can get a bag of fun size Snickers Crisper chocolate squares (fifteen individually wrapped chocolate squares with 100 calories each) for FREE after Register Rewards. You pay $3 at the register and the register spits out a $3 Register Reward. You can use that on your next purchase. You have to spend at least $3 to use the $3 reward, you can’t do partials. Make sure you pick that up before you leave the store. The cashiers are trained to hand them to you, but sometimes they may forget. So make sure you don’t walk out the store without it! Since this is not a rebate, you can theoretically get as many as you want. I don’t think you can use the Register Reward to pay for it and get another, but you should be fine if you pay with “new money”. If you are active in the Walgreens Rewards program, there’s an easy way to earn 500 points. 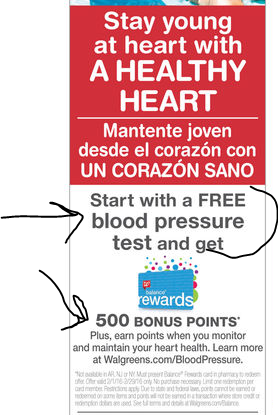 According to their Weekly Ad for February 7-13 in 2016 (see relevant parts of the screenshot right below), you get 500 points if you get a free blood pressure test. I am assuming this is the arm measurement type, so it should be quick and easy and painless. I will try to test it next week to see how it works. I don’t know if a pharmacist is necessary for this, or any other Walgreens employees – in other words, I don’t know how the 500 points are awarded, human intervention or automated? NOTE: according to the ad there, this offer is not available in Arkansas, New York and New Jersey. I am going to guess it must be some kind of State Law prohibiting health-related rewards or something like that? This is a big-YMMV because this is a clearance sale at Walgreens brick and mortar stores, and both supplies and availability of the offer depend on multiple factors. I obviously can’t check every single store in the country. These are on clearance, with that bright orange clearance tag. 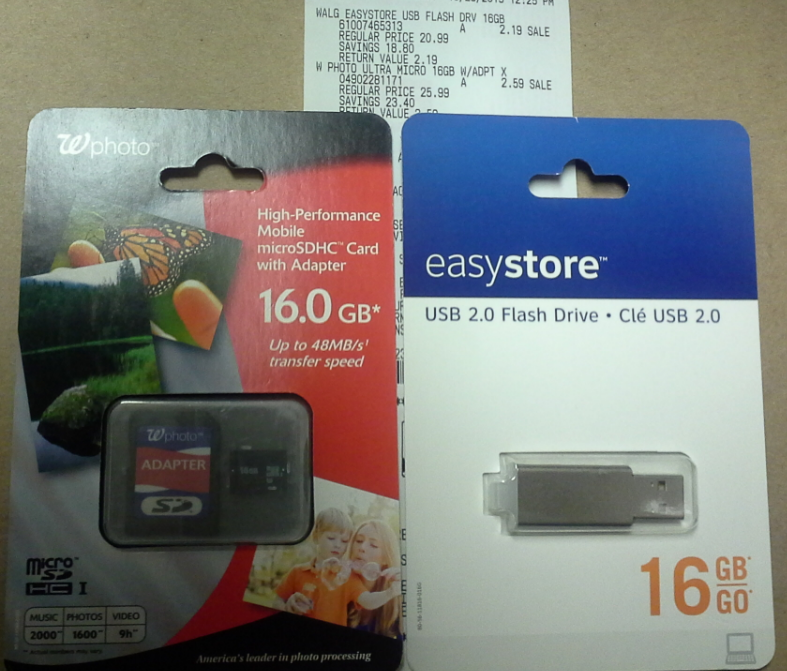 The 16GB USB drive is an Easystor brand, with the older USB 2.0 standard. The back says Easystor is from Ireland, was made in China and comes with a two year limited warranty. The price, as you can see on the receipt below is $2.19. No coupons needed, it’s the clearance price marked in their system. The 16GB microSD card is “Walgreens Photo” branded, a microSD with a full size SD adapter included, and can go up to 48MB/sec (read speed). The back says made in China, but I could not find any clues as to who the manufacturer is. The memory card price is $2.59. I haven’t taken them out of their packages yet, so I don’t know how well they perform. As I said above, this is a big YMMV since I can’t check every Walgreens store. There are thousands of them! The Holiday Gift Bundles have already began rolling out at brick and mortar stores. And if they did so at your local Walgreens, for just $10, you can get a pretty reasonably-priced Sharper Image bundle that includes a 17oz stainless steel container and a 15oz coffee mug. The 17oz keeps the drinks hot/old longer, but the 15oz is easier to drink from while driving. If you are part of the Walgreens Rewards program, for three days only (Sunday October 18 through Tuesday 20th in 2015), you will earn 5X Rewards points if you make an in-store purchase of $10 or more. You have to use the coupon for this offer, which is on the top-right corner of their Weekly Ad for the October 18-24 week or you can clip it online or via their app. This is essentially 5% on the purchase price. This is a YMMV promotion as it is sent by Walgreens Rewards via email to their rewards members. To take advantage of this offer, you have to “Clip to Card” (activate the offer). The offer gets you 4000 Bonus Points if you make a single purchase of $20 or more at Walgreens. Check your emails or logon to your Walgreens account and check to see if that offer is available to you. Good until the close of business on Saturday August 15 in 2015 at Walgreens brick and mortar stores, you can get two 12oz Honey (bear containers) for $5 total using the coupon that can be found in their weekly ad which can be found right by the entrance of most Walgreens stores. That’s 1.5 lbs of honey for $5. The only ingredient is honey. Obviously don’t expect “advanced” features you would get from the more expensive “honeys”. The 1c items include sharpeners, erasers, and pencil pouches. The offers are limit three per item, so not bad. At the 25c price level, there’s glue, rulers, and broad tip markers. And at the $1 price point, there’s Sharpies five packs (yum yum!) and Papermate mechanical pencil sets and mini staplers.